Whether you have a sink drain that is draining slowly or a main sewer line stoppage, Allright Plumbing and Heating is the company to call for all your drain cleaning needs. Our technicians are licensed and insured as well as thoroughly trained to address any drain issue you have. We can clean your kitchen sink drain, unstop a toilet, clean the main sewer line, perform a video inspection, and more! Only the best, up-to-date equipment is utilized to make sure that your drain lines are running smoothly. Call our local plumbers in Colorado Springs today to receive a free phone estimate and schedule your appointment (719) 597-1099! HOW DO I KNOW WHAT KIND OF DRAIN CLEANING I NEED IN COLORADO SPRINGS? When it comes to keeping your pipes clean and your drains unclogged, there are several options available. Our Colorado Springs plumbers typically use one of two solutions for drain cleaning: plumbing snakes or hydro jetting. Each has its advantage. When each is used, is determined by the type of drain blockage encountered and the types of problems experienced. Explain your drain issues and our well-trained office staff will help you. Snaking a clogged drain is done with an auger. This is a long steel cable with a coil at the end of it. The cable is attached to a motor that spins it as a cutter on the end breaks through any obstruction. Most drain clogs are efficiently addressed by using a snake or cable. This is a tried and true method for drain cleaning in Colorado Springs. This method is most often used on minor clogs. 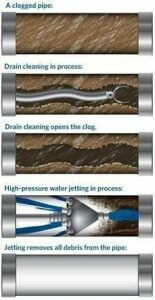 When snaking is ineffective or drains clog continually, Hydro jetting may be the answer! This method is used for both residential homes and commercial properties. The technician uses heavy equipment with a hose with a special nozzle to send a powerful force of pressurized water through your pipes. Your sewer line is scrubbed clean of any obstructions! Outside Cleanouts or openings to the main sewer line are required to accommodate this more extreme drain cleaning jobs in Colorado Springs. When you need to know the overall health of your drain or sewer system, a video inspection is warranted. Allright Plumbing and Heating has skilled technicians who are highly trained at inspecting your drain line to determine the appropriate recommendations. These recommendations will help you plan for preventative maintenance, repairs, or replacement. You can watch, in real time, as your sewer line is inspected with a camera! The technician will then provide you with a copy of the inspection as well as recommendations. Broken, Cracked, or Collapsed Pipe – These types of anomalies require repair and/or replacement. Offset Pipes – Sewer pipes that have become misaligned due to shifting soil, frozen ground, settling, etc. Blockage – Tree Roots, grease, or foreign objects that are restricting or prohibiting proper flow and/or cleaning of the line. Leaking Joints – The seals between pipes have broken, allowing water to escape into the surrounding area. Broken or compromised joints also allow tree roots and dirt to impede the sewer line. Root Infiltration – Tree or shrub roots have invaded the sewer line, preventing normal cleaning. Roots may have damaged the pipe. Off Grade Pipe – Existing pipes are constructed of a substandard or outdated material that may have deteriorated or corroded. 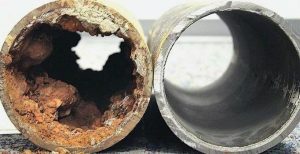 Corrosion – The pipe has deteriorated and/or broken, causing sections to collapse and restrict water flow. Nothing is worse than buying a home, only to find out the sewer line must be replaced or repaired! We always recommend that new homeowners have a video inspection of the sewer line at the property they are considering purchasing. Understanding the present condition of your sewer line can be a bargaining point for any buyer as well as help you make a valuable decision in whether to purchase that property! It is to your advantage to know the condition of the sewer system and the drains in the house just as you should know the condition of other major appliances like the water heater and furnace. Call today to receive a free phone estimate and schedule your Colorado Springs drain cleaning appointment (719) 597-1099. Hydro jetting is a process of cleaning your sewer drain with high water pressure. Water pressure of between 2000 and 4000 pounds per minute is utilized to clean grease, sand, sediment tree roots, etc. that has built up over time. Use of Hydro Jetting thoroughly scrubs the line clean, leaving no debris behind. The jetting tool works in two ways: First, as the tool moves forward, the high water pressure stream removed debris along the wall of the piping. Second, reverse water jets propel the tool down the pipe. These reverse water jets also remove debris on each and every part of the drain. As well, when the nozzle is pulled back, these reverse water jets create a force that removes any debris not yet broken up by the initial run. Hydro Jetting is more effective at a longer distance. Our jetting machine carries 500 feet of hose. The jetting hose delivers the same amount of pressure and cleaning quality at 50 feet as it does at 500 feet. This is in direct contrast to a snake/cable machine. The cable machine has a motor that produces a fixed amount of torque or power to run through the clog or roots. The more cable that is required to reach a clog, the less torque or power is transferred to the cutting head at the blockage. This is because the cable begins to absorb some of that energy. A traditional cable machine is primarily limited to 150-200 feet whereas the hydro jetting machine can run out 500 feet with no issues or loss of pressure. This makes it more effective for longer sewer lines as well as lines which contain many years of debris build up or tree roots. Large versus small hydro jetting machine. Allright Plumbing and Heating utilizes two different jetting machines depending on your needs. The larger machine is mounted on a trailer and pulled behind a vehicle. This machine requires a large amount of water and is used when a property has an outside cleanout only. This machine produces up to 4000 psi at 18 gallons a minute and is not safe to use inside a property. It is used to clear a main sewer line. Outside clean outs are required to access the main sewer line to ensure safety. The smaller machine is perfect for cleaning a kitchen or interior sewer line 3” or less. This machine delivers 1500 psi at approximately 2-3 gallons per minute. It is used to remove grease and soap build up on smaller sewer lines such as a kitchen drain. When a sewer line has been identified as having a problem, we recommend that a video inspection of the line be completed. This will help in identifying any anomalies that may be affecting the flow of the line. If a major issue is identified, an estimate for sewer line repair or replacement will be provided to the homeowner. This is a major decision for most homeowners as the cost can be expensive. The last thing you want is to feel pressured or rushed to make a decision. Extra time is allowed so that you don’t feel rushed and all your questions are addressed. Allright Plumbing and Heating will provide you with the detail needed to make an educated decision on repairing or replacing the sewer line. 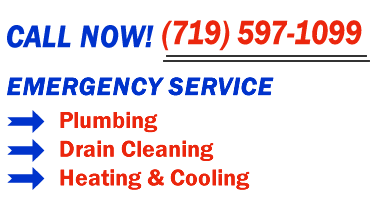 Call Allright Plumbing and Heating today to receive a free estimate on sewer line repair/replacement, drain cleaning, and more in Colorado Springs!